Plumbing systems are made up of two primary parts: water supply and waste disposal. The exception to that rule is the dreaded sewer backup. This can be a traumatic event for homeowners. If you know the early warning signs though, you can often stop problems before they become severe. Most serious backups happen on the main sewer line. This is the single pipe that all of your drains eventually lead to. 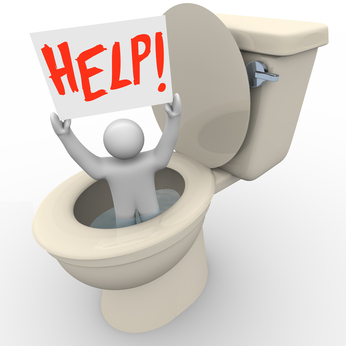 If your blockage is on the main sewer line, it’s not safe to run any water in your home or flush any toilets because there’s nowhere for that waste to escape to. The other option is that a backup can happen on a single drain line. This is typically caused by acts like rinsing food scraps and grease down a kitchen sink or a child flushing something down the toilet. Backups can sometimes be resolved with a toilet auger or drain snake. Never use chemicals. They are ineffective and corrode your pipes. Sewer backups can be caused by natural events, like roots in a sewer line. Pipes can also wear out in some areas over time. Sewer line backups can also be caused by human behavior. Hair, grease, feminine products, food scraps, or any item that can get caught up on ridges in the pipes can overwhelm the system. If you suspect your main sewer line is backed up, the first thing to do is go outside your home and look for a cleanout. This will be a four-inch piece of white pipe that sticks a few inches out of the ground. By removing the cap, you will release some of the pressure from the line and give the waste somewhere to escape. The next step is to turn off the water to your home until an expert can get there to inspect the line. One of our professionals at Restoration Experts will come extract the sewage, remove items, and apply industry-grader cleanser to surfaces. As we work, we also document the process and take detailed pictures for insurance claims. We also have a step-by-step method of diagnosing and repairing a damaged or blocked sewer line. For more information on our plumbing services, visit us online or call 1-877-959-8662.